Click to Login or Create an Account. Each outlet on the unit is independently controllable by the software. 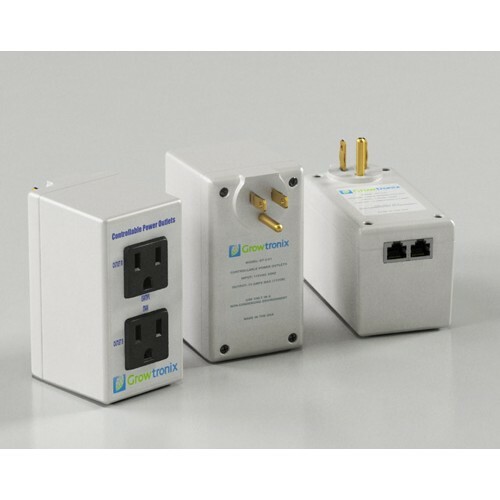 The unit has a total power rating of 15 Amps. Each outlet can switch up to 9 Amps. However the combined amperage of both plugs cannot exceed 15 amps. Q: Can these be used with to switch 240? A: No, these units only switch a single pole. 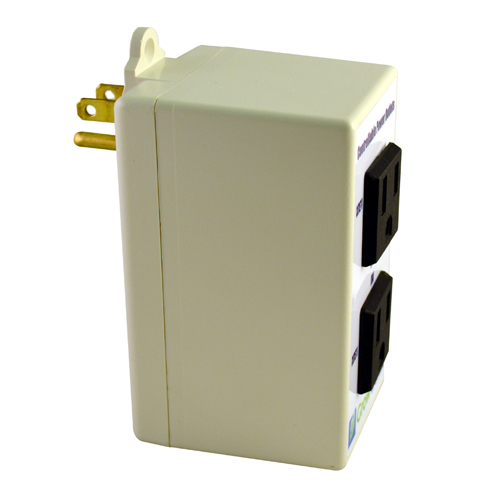 240v should be switched by a dual pole relay or contactor. If the relay or contactor has a 120v trigger, you can plug the trigger into a controllable outlet to properly control a 240v load. Q: What if I need to switch more than 9 amps? 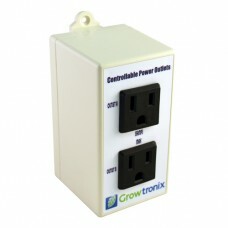 A: You can use a Growtronix outlet to control a bigger relay such as a UPM-1 or a contactor with a 110v-120v coil. Q: I have many HID lights do I need an outlet for each. A: It's usually best to use a lighting controller such as a MLC-4. These units have a power cord called a trigger cord that when plugged into a power outlet switch the power to all the lights. By plugging the trigger cord into a Growtronix Controllable Power Outlet you'll gain control of all the lights using a single controlled outlet. In some cases it's desirable to have the Growtronix system turn off one "Bank" off lighting to allow the space to cool down to acceptable levels, later turning back on when the cooling system is capable of maintaining an acceptable temperature. It can also be setup to alternate the lighting so that the garden continues to receive equal illumination.